Rainfall is difficult to measure over the ocean. The rain gauges commonly used on land collect water in a tube and do not work at sea, where they have to be mounted on surface buoys or ships that pitch and heave in response to ocean waves. Specialized rain gauges have been developed for use at sea, but they are easily damaged or stolen when mounted on buoys on the ocean surface. 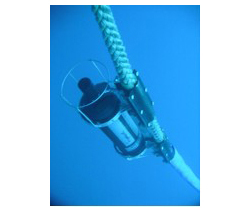 Acoustic Rain Gauges (ARGs) have been developed that can be placed safely beneath the ocean surface to record the sounds produced by rain. The unique characteristics of the sounds produced by different kinds of rainfall allow scientists to use these recordings to identify and measure raindrop size, rainfall rate, and other features of rainfall over the ocean. The sound of rain recorded by the acoustic rain gauge comes from an area of the sea surface above the instrument. This area increases as the acoustic rain gauge is placed deeper in the ocean. An average measurement of rain over an area is better than a measurement at a point because rainfall can vary dramatically over short distances. 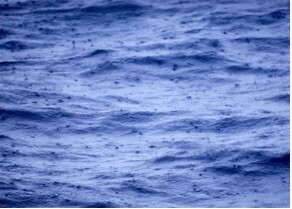 Rain falling on the ocean makes a loud and distinctive sound that can be used to detect and measure rain at sea. Individual raindrops make sound under water in two ways. The impact of the raindrop hitting the ocean surface makes the first sound. Following the initial impact, sound can radiate from bubbles trapped under water during the splash. For most raindrops, the sound produced by the bubbles is louder. Raindrops of different sizes produce different sounds. Small raindrops (0.8-1.2 mm) are remarkably loud because they generate bubbles with every splash. They produce sounds between 13–25 kHz. Medium raindrops (1.2-2.0 mm) do not generate bubbles and are therefore surprisingly quiet. Large (2.0-3.5 mm) and very large (>3.5 mm) raindrops trap larger bubbles, which produce sound frequencies as low as 1 kHz. Breaking waves, which are made by wind, produce underwater sound in a similar way. (How is sound used to measure wind over the ocean?) However, when the sound levels of the underwater sounds produced by rainfall and breaking waves are plotted versus frequency, each has a distinctive shape. Drizzle has a unique peak at frequencies from 13–25 kHz, for example. Rainfall produces relatively more sound between 5–15 kHz than wind. The sound of heavy rain is very, very loud compared to the sound produced by breaking waves at all frequencies. Although an individual breaking wave is a louder sound source than a single raindrop splash, the surface of the ocean is uniformly covered by raindrop splashes, whereas breaking waves are more intermittent. 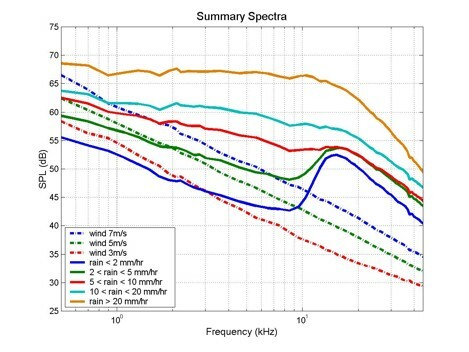 The figure below shows sound level at different frequencies for both wind and rain. The sounds generated by wind are due to breaking waves. The dashed lines show the sound levels due to wind at three different wind speeds. Labeled 3, 5, and 7 meters per second (m/s), approximately 6, 10, and 14 knots, this is the amount of sound that is due to wind alone. The solid lines show the sounds generated by different types of rainfall. The blue and green lines are for drizzle, showing a peak in sound from 13 to 25 kHz. The red, turquoise, and orange solid lines show the sound levels due to rain at different rates of millimeters per hour (mm/hr). 2000, “Climate Change Gets Wet.” Space Daily News, March 2, 2000.